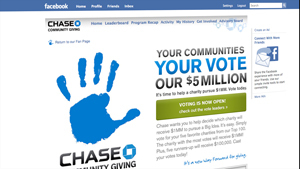 Chase's Facebook charity campaign will award $5 million to the groups getting the most votes. (CNN) -- This week, 100 charities are battling for votes on Facebook to win $1 million. The competition is a new approach to philanthropic giving and is led by JPMorgan Chase, which throughout the competition will donate a total of $5 million to 100 charities chosen by Facebook users. Traditionally, organizations would go through a grant process, and Chase would choose who would get its money and how much. However, late last year, Chase decided to take a different approach and put the power of choosing charities into the hands of Americans. Chase took a database filled with 500,000 nonprofit organizations and uploaded the information on to Facebook. The bank then allowed "crowdsourcing" to choose which charities should be recognized in the Chase Community Giving competition. The top 100 charities won $25,000 and advanced to the second round, where another vote will determine which organization will win $1 million. The five runners-up in the second round will receive $100,000 each. Another $1 million will be given to a single charity chosen from the original group by a Chase board of directors set up to oversee this competition. The concept of crowdsourcing corporate giving via online communities and voting was first used by American Express in 2007. In the Members Project, American Express would donate $5 million to charities submitted and selected by card members. But Chase has taken a huge leap by moving the entire competition to Facebook. "We wanted to find a way where we could hear from the communities we were operating in and hear what was important to them," said Kim Davis, president of the JPMorgan Chase Foundation, who oversees their philanthropic work worldwide. The philanthropic arm of the large bank donates annually $100 million to organizations around the world, Davis said. "This, for us, is very much about testing out a new way of doing corporate philanthropy for the firm." More than a million fans have participated in the Facebook program. Along the way, obscure charities have joined better-known ones near the top of the rankings. Because the winners of the first round worked hard to organize their online communities, smaller charities with get-out-the-vote passion were able to compete with larger organizations. Thus, the final 100 charities range from the large Susan G. Komen for the Cure (which claims on its Web site to be the "world's largest grassroots network of breast cancer survivors and activists") to the Feel Your Boobies foundation, started by a woman in her garage, who wants to increase awareness of breast cancer screenings in young women. As of midday Thursday, the top vote-getting charity on the contest's Facebook page was Invisible Children Inc., a nonprofit that seeks to combat child-related violence in Africa through documentary storytelling. Other companies are starting to pick up on crowdsourcing corporate philanthropy. We wanted to find a way where we could hear from the communities we were operating in and hear what was important to them. Pepsi is donating $20 million in grants this year to applicants who submit "good ideas that move communities forward," said Bonin Bough, the global director of digital and social media for Pepsico. If someone wants to build a park in their neighborhood, that is an idea that can be submitted. "Big or small, this is about the power of ideas and the individual," Bough said. The voting will take place on a separate site that Pepsi created. But the beverage company is providing tools -- widgets to post on Facebook pages, Twitter accounts, Tumblr blogs and other social networks -- to make it easy for applicants to campaign for votes. David Levy is the co-founder of Social Vibe, a 2-year-old company based in Los Angeles, California, that designs marketing campaigns around social good for companies such as Kraft Foods and Coffee-Mate. "The new role of the [advertising] agency is to figure out for the brand what users want to share," he said. Although Levy's work may be philanthropic, he is in the marketing business. Levy does not doubt that what Chase and Pepsi are doing is partly for public relations purposes. He said, "We all have to own up to the fact that brands are in the business of making money." Pepsi's Bough is quick to point out the unprecedented amount of money being donated to support people's ideas. "It is not just about headlines," he said. "It is about delivering impact." Chase points to its long history in corporate philanthropy, which started in 1804. The company said that if it was a public-relations effort, the competition would be done differently, with advertisements in newspapers and corporate PR representatives pitching reporters. Publicity stunt or not, representatives for the charities said they have positive feelings towards Chase. "I think it is an amazing contest," said Jared Paul, whose A Good Idea charity is now competing for the million-dollar final prize. He believes that the contest "is going to be a great example of how organizations can spend their money and serve communities in need." A Good Idea is a volunteer organization that provides services to the homeless and underserved youth in San Francisco, California. Paul is hosting a voting party this week with drinks, food and computers so people can log onto Facebook and vote.